I really like croquettes and since I've been trying to eat at home more often during the week, I decided to make some. Menchi katsu, is a type of croquette made from minced meat -- usually beef or pork. This is an easy dish that can be prepared quite quickly and it's quite tasty. Mix together ground beef, one egg, breadcrumbs, onion and mayonaisse by hand until the mixture comes together in a sticky ball. Season with salt, white pepper and garlic powder to taste. Roll into balls, then flatten slightly. I used an ice cream scoop, but the size is normally determined by how large you want the croquettes to be. Dip each "patty" in flour, then in egg, finishing with panko. Fry in vegetable oil until golden brown. Drain well, then serve with katsu sauce. Start with about 1/4 cup ketchup and 2-3 teaspoons of Worcestershire sauce. Add the rest of the ingredients according to taste. Reid - That looks as about perfect as it gets, great job! I love this! I haven't eaten this in ages! I need to get more oil for deep-frying. Better yet, I need to use something other than a wok, which is too uneven. oh, I am definitely going to make this. I love anything with the word croquette, rice ones, potato ones.. But the beef ones sound even better! I have this line where I wont deepfry stuff at home.... I can see that it would be a sliding slope from there.. but I bet this would be ok baked... I will give it ago and let you know! I love menchi katsu too, but I normally don't make it at home. I think I'm going to start making it more though especially since it's so easy. I know what you mean about the hunger pangs, especially if I'm reading food blogs early in the morning or very late at night. This is a really simple recipe and it tastes really good too. If you do try this, I'd be interested to know how it went. You might be able to get away with baking these, but I'm not sure how crunchy they will be. If you do decide to make this, I'd be interested in knowing how they turn out. Yum! Thanks Reid for the recipe. I usually buy them from Isetan and now I have the recipe, I'm going to give it a try at home. ::laughing:: There it is Mills! Yea Reid, I've become a menchi katsu expert of sorts... ::grins crookedly:: how do you suppose that happened? As for serving, I use Heinz 57 sauce and garden tomatoes. Oh man, talk about an incredible flavor combo! Don't forget to serve with fresh tomatoes. You know Reid, back home "Fried Green Tomatoes" are done with a corn meal coating. I think I'm going to try a panko style coating and do it up with some menchi. Gads, it must be lunch time! You're welcome. If you end up making these, let me know how you like them. The original recipe that I got from someone contained milk, which I didn't like at all. I ended up substituting Kewpie brand mayonaisse and thought it tasted much better. Thank you! You can usually find this at most Japanese restaurants that serve croquettes. 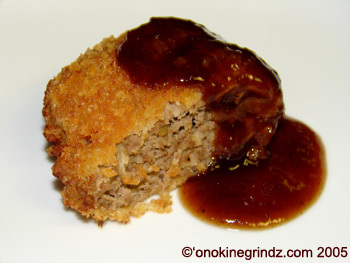 They might be called hamburger croquette. Here it is sometimes listed as hamburger katsu. Thank you...and you're welcome! I hope you get a chance to make this. It's really quick and simple. It's like coating a hamburger with panko and then frying. Hope you and your wife enjoy this! ::laughing:: I just wish the rest of my body would get as active as my mind! I sit here typing away with all these yummy ideas then stand up, go to the kitchen and wonder what the heck I'm gonna do for dinner! I made it last night, the whole family loved it!